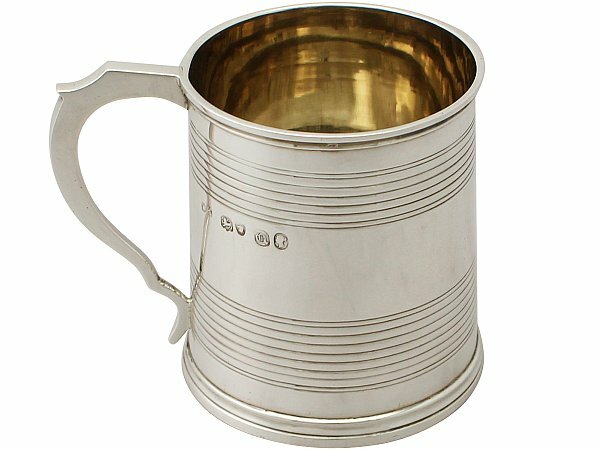 This exceptional antique Victorian sterling silver christening mug has a plain tapering cylindrical form. The body of this mug is encircled with two fine and impressive broad bands of tooled decoration and an applied moulded border to the rim. The mug is fitted with an impressive plain faceted angular handle with an incurved shaped thumbpiece. This exceptional example of antique silverware retains the original gilt interior. This antique christening mug is an exceptional gauge of silver, exceptional quality and in exceptional condition. The tooled and applied decoration is all very sharp. Full hallmarks struck to the surface of the mug are all very clear. Reflections in photography may detract from the true representation of this example of Victorian silverware. Length from back of handle to rim 8.2cm/3.2"